Heavy security checks on the entrances to Tahrir Square could be the reason for the relatively low numbers entering the square, our correspondent says. 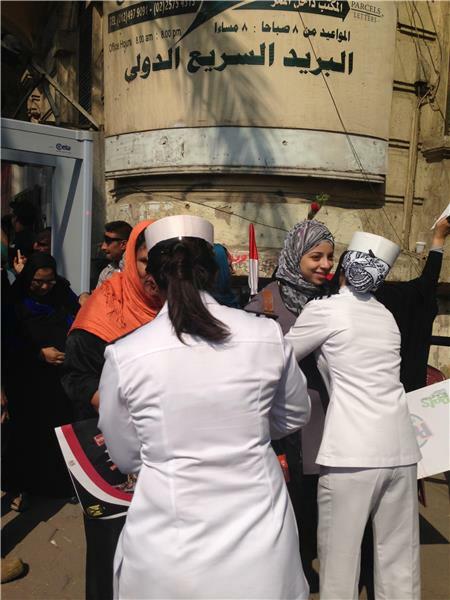 Another correspondent sent this image of female police officers searching women as they entered the square. One of our correspondents, who we cannot name, says the anti-military rule march they are on numbers about 2,000-3,000 people. Our correspondent reports the police forced the crowd away from Tahrir Square by firing tear gas at them and shooting rounds into the air. This crowd seems very determined, despite the fear of the violence they may meet." Our correspondent says there is a "carnival atmosphere" in Tahrir Square, where a few thousand people have gathered for the 40th anniversary of the October War with Israel. Security forces around the edge of the square, however, are preparing for clashes later in the day as anti-military marchers make their way to the square. 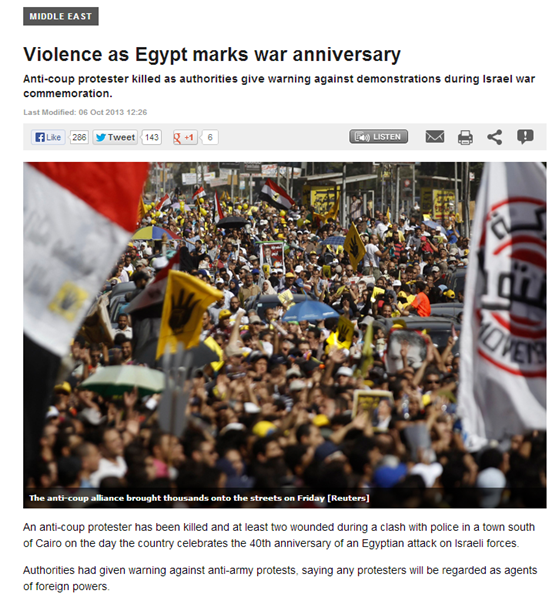 We are also running a news story on what is going on in Egypt on the main page. 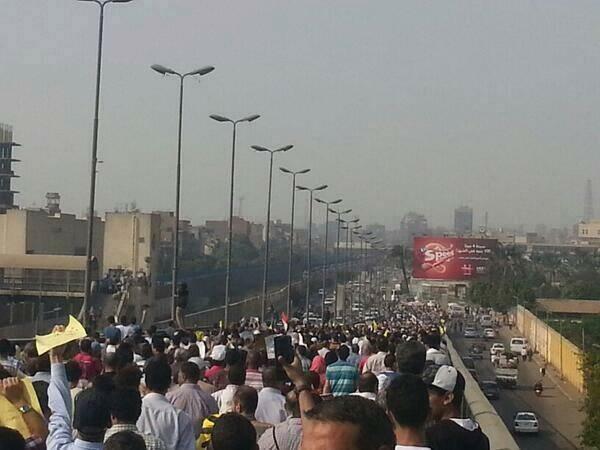 A slideshow of Tweets showing just some of what is going on across Egypt today. 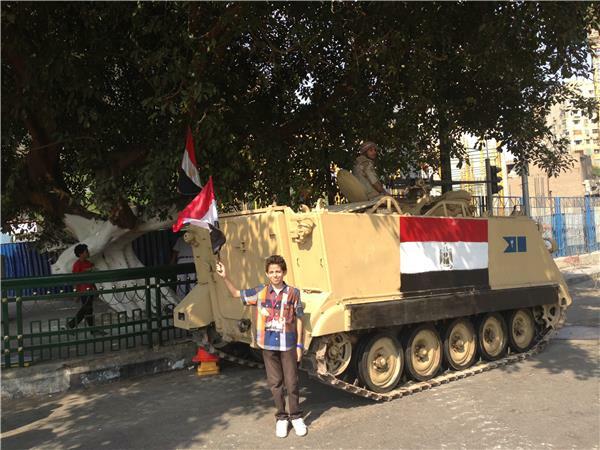 A young army supporter poses next to the armed forces on his way to the October 6 celebrations. Away from the demonstrations in Cairo, and to the violence that continues to blight the Sinai peninsula. Two armed men killed a policeman in El-Arish, northern Sinai, while army troops fired on a car near the border with Gaza. At least 10 explosive devices prepared to be remotely detonated were found in the car, according to security officials. One of our correspondents sent us this image of pro-military Egyptians celebrating the 40th anniversary of the October War. Are you at any of the demonstrations? 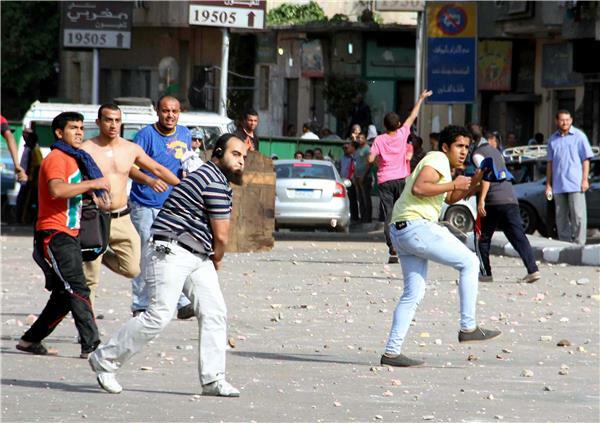 Reuters reports that medical sources have said that police responded with live fire after demonstrators threw stones at them. An anti-coup demonstrator was killed and at least two more wounded, according to the medical sources, after a demonstration in Delga, a town south of Cairo, turned violent. Initial reports indicate the man who died was a Muslim brotherhood supporter, but this has not been confirmed. 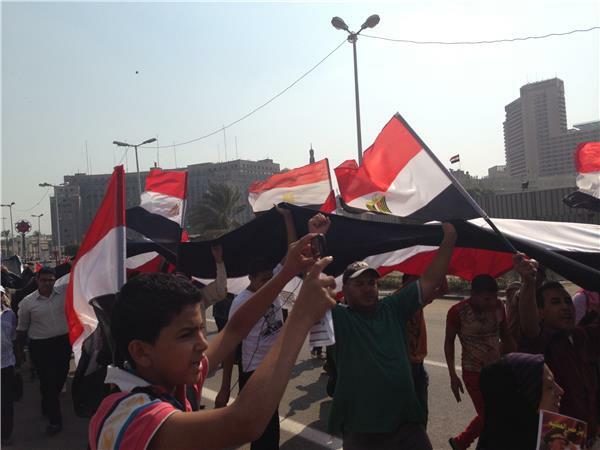 The marches are a mixture of pro-Morsi protesters and those who are anti-military rule, as opposed to being supporters of the Muslim Brotherhood. AJ Staff have come together with the families of those journalists still being detained in Egypt in a display of solidarity. Follow the hashtag #FreeAJStaff for more tweets on the subject. Here is a slideshow of just a few of the posts staff and members of the public have uploaded. "there are those who speak much, & those who die for the sake of speaking a word of truth." In honour of all those who do so. Egypt's Interim President's media adviser Ahmed Al Moslemany has said in a statement "those who are protesting against the military in the occasion of 6th of October anniversary are agents not activists." Al Moslemany also added "it is regrettable that some people do not appreciate this great victory, but it is a crime that some people are working on extinguishing the joy of nation in the memory of victory." In a speech, Egypt's interim President Adly Mansour said the government is "writing a constitution for all Egyptians." 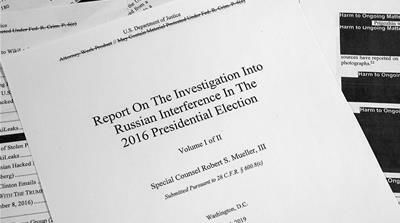 "We are moving together to the future according to steps that assured your will on June 30, 2013 and sequel to the goals of January 25, 2011." "Today, we are writing our own constitution, a constitution for all Egyptians being written by all Egyptians, not a group or faction's constitution. " "I announce the start of founding nuclear plants for peaceful use, and Al Dabaa will be our first site under study." "I announce also before you the start of the first steps of the Suez Canal development area project." An Egyptian Military Court has ruled that award winning journalist Ahmed Abu-Draa will be given a six-month suspended sentence after being found guilty of endangering national security by spreading false information. 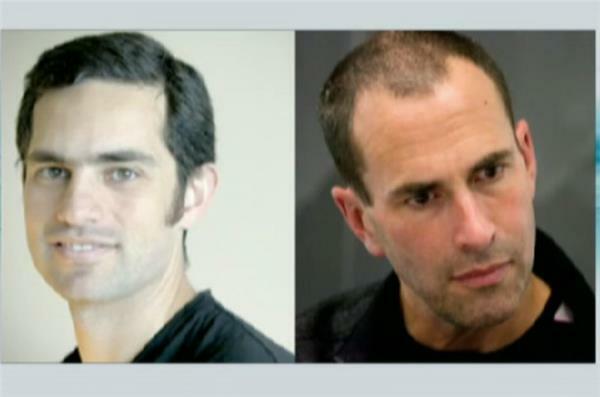 It comes as two Al Jazeera journalists remain in detention weeks after they were first arrested. Here are some tweets posted by the Anti-Coup Alliance calling for rallies tomorrow. Our correspondent in Cairo, who were can not name for security reasons, says that the military band has started practicing in Tahrir Square ahead of tomorrow's anniversary celebrations. Our correspondent says that there are many people preparing for the parade amid a tight security presence. There are plans for al-Sisi and the interim President and Prime minister to appear during tomorrow's celebration, although the government has said this could change if the security situation worsens. 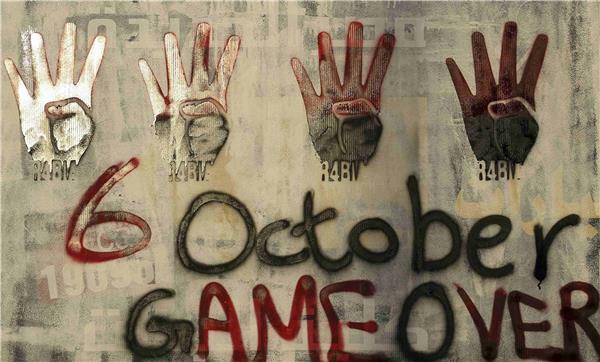 Signs of the "Rabaa" or "four" were seen during a protest against the military by supporters of ousted Egyptian President Mohamed Morsi and those who object to military-rule near Rabaa al-Adaweya square in Cairo, October 4, 2013. Friday's marches were the most ambitious attempt by the Muslim Brotherhood to press its demands since August 14, when authorities smashed two pro-Mursi sit-ins in Cairo and then declared a state of emergency and imposed a curfew. The signs are in reference to the police clearing of Rabaa al-Adawiya protest camp on August 14 and demonstrations organised in Egypt for October 6. 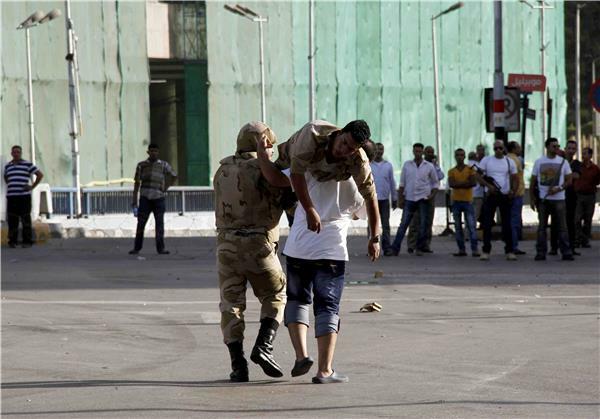 Many were injured and others were arrested during protests that erupted across Egypt after Friday prayers. It has been announced that Tahrir Square will remain closed until Monday, despite previous plans to hold celebrations there on Sunday to mark the 40th anniversary of Egypt's war with Israel. Al Ahram, the state run news agency, is reporting that Khaled Dawood, former spokesman for the National Salvation Front, has been stabbed. According to the news agency, he was taken to the Egypt Children's Hospital, where the doctor treating him reported that he had been stabbed with a flick knife in the chest and the hand. The attack happened in the Abu Rish area of Cairo. The former NSF spokesman resigned in protest against the violent crackdown on demonstrators. Our correspondent in Cairo, who we can not name for security reasons, reported a slight increase in the numbers of people taking part in recent protests after Friday prayers each week. 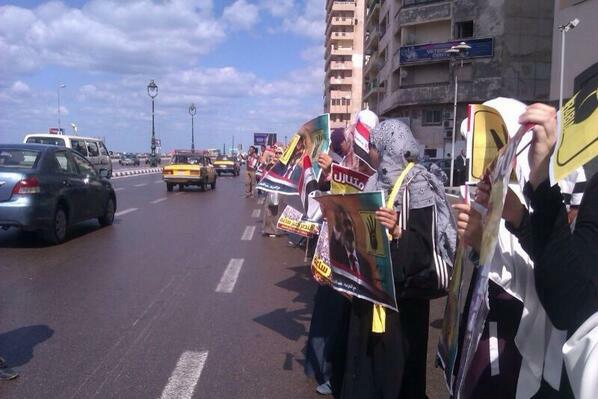 "These protests are held under the umbrella of the anti-coup alliance, some are supporters of Morsi and the Muslim Brotherhood, but others simply fear democratic losses after what they campaigned for because of the way the military and the interim government is controlling the country," our correspondent said. Our correspondent, reporting from Cairo, has reported that two groups of protesters were trying to form a larger group when tanks rolled in and fired tear gas. The correspondent confirmed that live gunfire had been used, but that it was fired in to the air rather than at the crowds. 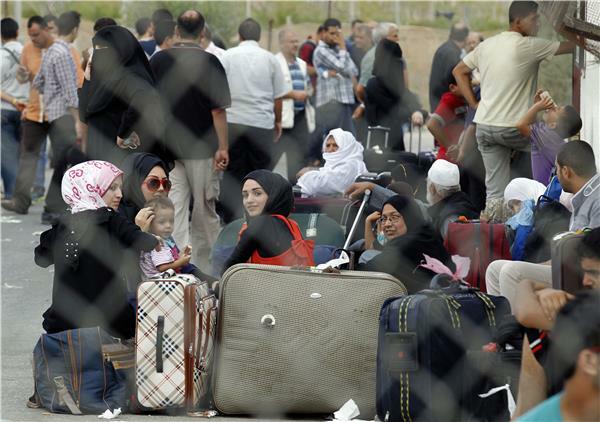 "It was a tool for trying to disperse people trying to gather," our correspondent said. Heavy gunfire is being reported in Cairo as weekly demonstrations, that have been held after Friday prayers regularly since the over-throw of Morsi, escalated into violence. Our Cairo-based correspondent, who we are not naming for security reasons, reports that all entrances to Tahrir Square have been closed off by security forces. Security forces have closed off Rabea al-Adaweya square in Nasr City to prevent attempts by "Anti Coup" protesters to return to the square. 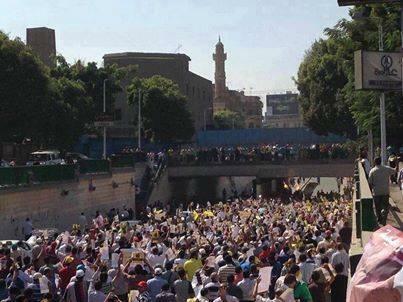 It was the site of their main sit-in after the over-throw of deposed President Morsi. The original sit-in was broken up by the Egyptian security forces on August 14. 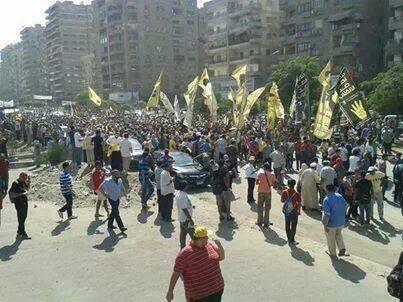 An Al Jazeera source in Egypt reports that fighting has erupted in the Suez governorate between opposing protesters. Security forces fired tear gas into the crowd to end the fighting and scatter the protesters. This image was tweeted by user @khaled_aleraky with a caption describing it as the scene from the demonstrations in Alexandria. During a press conference at the end of her visit to Egypt, Catherine Ashton said that "we are not mediating any talks'' to achieve national reconciliation, adding that the government needed to be asked about that and that the EU understood the necessity of having an inclusive process, including drafting the constitution. Answering a question on the possibility of defence minister and head of the armed forces Abdel Fatah al-Sisi running in the Presidential elections, Ashton said that it was up to individuals to decide whether they wanted to be candidates or not, adding that it should be an inclusive process that includes everyone and the EU encourages everyone to participate in it. 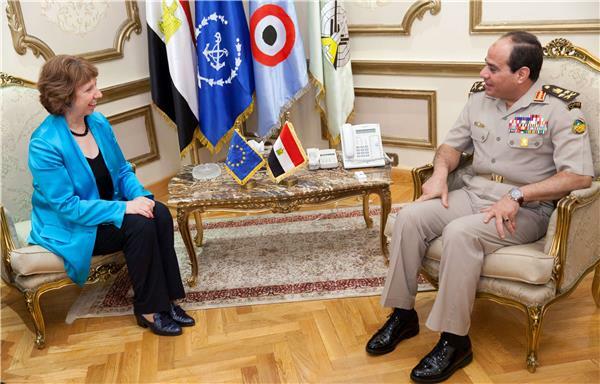 The Egyptian Armed forces issued a statement saying the meeting (between Ashton and Sisi) discussed views on issues of mutual interest and methods to support cooperation between Egypt and the EU countries. During the meeting, there was more understanding of the European responsibility towards the challenges that Egypt faces, the army said. A video has emerged which appears to show Egypt's military generals deciding how to deal with the country's media. The footage - released by activists - shows General al-Sisi addressing senior officers of the army in the months before Mohamed Morsi was ousted from power. 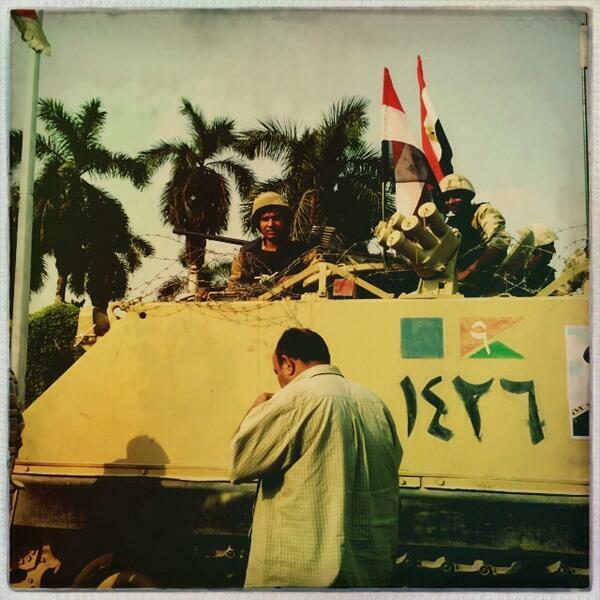 The recording starts with an officer urging Sisi to find a way to frighten journalists from criticising the army. The head of Egypt's military is the focus of a number of campaigns that want him to run for president. General Abdel Fatah el Sisi oversaw the July 3 coup that ousted the democratically-elected president, as well as the subsequent crackdown on the Muslim Brotherhood and their supporters that led to more than a thousand people being killed. 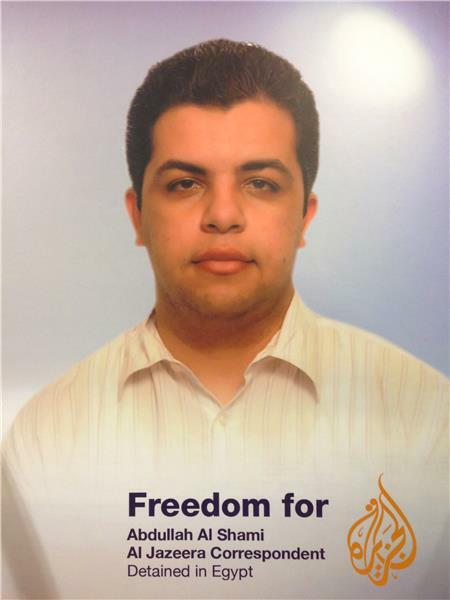 Al Jazeera's correspondent in Cairo, who is not being named for security reasons, reports. An Egyptian soldier was shot dead in the Sinai Peninsula on Saturday, security officials said, as army helicopters carried out air strikes on suspected hideouts of fighters there. 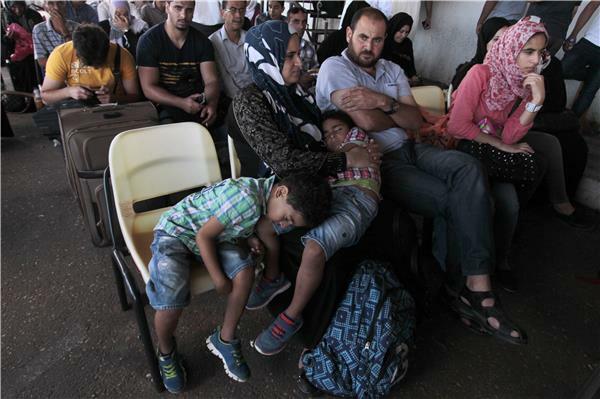 Egypt reopened the Rafah crossing with the Gaza Strip on Saturday after a nine-day closure, an official of the enclave's Islamist Hamas government said. 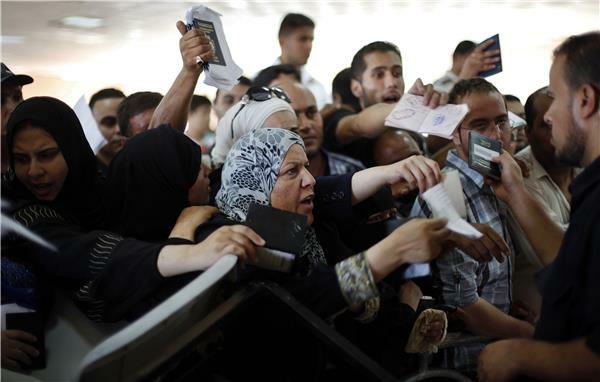 Since the July 3 army coup that ousted Egyptian President Mohamed Morsi, Egyptian authorities have repeatedly closed the Rafah border crossing, stranding thousands of Gazans. Amnesty International urges Egypt to release Ahmed Abu Deraa, an award-winning journalist who is facing military trial for his coverage of events in Sinai. The non-governmental organisation believes that Deraa is being prosecuted for challenging the army's version of its operations in the restive North Sinai region. Read Amnesty International's full press release here. Al Jazeera talks to Abdullah al-Arian, assistant professor of history at Georgetown University's School of Foreign Service in Qatar about the fresh wave of anti-coup protests in Egypt. 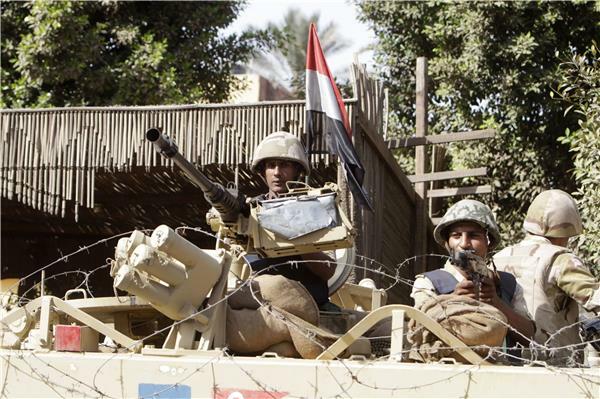 In North Sinai, one riot-police officer was shot in the head and killed by unknown gunmen. Al Jazeera's correspondent in Egypt, who we are not naming for security reasons, has said that some fighting has started to break out between local residents and demonstrators in Alexandria, Mansouria, Nasr City and Helwan. According to state TV, minor clashes has also started between residents and protesters in Maadi in Cairo and Mohandsen in Giza. Prosecutors have extended the detention of Al Jazeera's Abdullah Elshami for another 45 days, his lawyer said on Thursday. Elshami, an Egyptian citizen and reporter for Al Jazeera Arabic, was jailed on August 14 along with about 700 protesters when police and soldiers dispersed two Islamist protest camps in Cairo, sparking clashes that killed hundreds of protesters. "The decision to extend the detention of 665 people arrested in Rabaa came last night," said his lawyer Mostafa Attiya. Egyptian authorities and local media have accused Al Jazeera of biased reporting of the popularly backed coup that toppled Morsi. 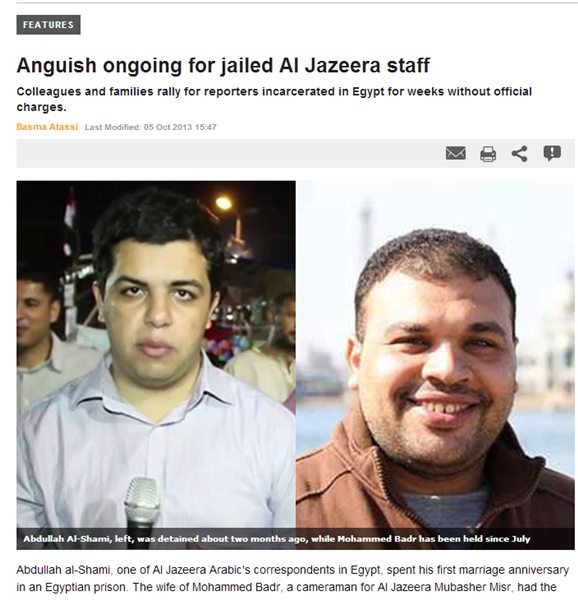 Al Jazeera is submitting complaints to international courts against Egyptian authorities for detaining its journalists. Egypt's state TV says security forces have raided a village near the Giza Pyramids west of Cairo hunting for suspects in the killing of 15 policemen last month. The Tuesday security sweep of Nahya, considered a stronghold for Islamist groups, is the latest move by authorities to assert control over towns and villages seized by supporters of ousted President Mohamed Morsi after his July 3 overthrow by the military. The police officers were killed in the nearby village of Kerdasa. Egyptian security forces say that it was done by sympathizers of the ousted president, after an Aug. 14 assault by the state forces on pro-Morsi protest camps left hundreds dead. 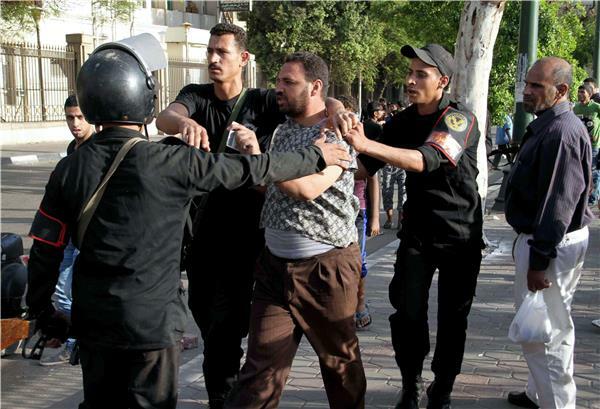 Security forces reoccupied Kerdasa last week, arresting scores of suspects. The public prosecutor's office in Beni Sweif governorate, south of Cairo, has ordered the detention of eight school students (their ages range from 16 and 19 years old), including the Beni Sweif's Freedom and Justice Party Secretary's son, for 15 days pending investigations on charges including belonging to a banned group and disabling public facilities. Sunday was the first day of the school year. Many universities and schools across the country saw students protest against the coup. This coincides with the Anti-Coup Alliance's call for the students, both in universities and schools to hold protests against the coup in a week dubbed "The youth are the mainstay of the revolution". Following news of an army operation in Kerdasa an Al Jazeera source is reporting a rally of people demonstrating against military rule in nearby Nahya. Earlier in the day, the investigation team from the General Prosecution announced it would be detaining 85 people arrested during the Kerdasa crackdown for a minimum of 15 days. Among the 85, the prosecution office says 21 were directly involved in an attack on Kerdasa police station in which 11 police officers and soldiers were killed. - Scaring the general public. More clashes are being reported in Egypt, this time by state TV. The subway in Dokki, in the Giza governorate, is the scene of clashes and gunfire. As yet there is no information about injuries. State TV is also reporting that supporters of the Muslim Brotherhood are blocking Salah Salem street close to Cairo International Airport. It could be a sign of strained ties since the ouster of Egypt's Islamist president Mohamed Morsi. A finance ministry spokesman said Doha "respects the decision of the Egyptian government to return a two-billion-dollar deposit to Qatar," following the failure of two weeks of negotiations on converting the funds into bonds. The deposit was part of an $8-billion Qatari aid package to Egypt after the 2011 revolution which toppled its president Hosni Mubarak. Doha-Cairo ties have been unsettled since the Egyptian army's July 3 ouster of Morsi, who had the strong support of Qatar, following a wave of popular street protests. Egypt returns $2bn to Qatar in sign of growing tensions | Egypt has returned $2bn that Qatar had deposited with its central bank, after talks to convert the funds into three-year bonds broke down, central bank Governor Hisham Ramez said. Egypt authorities have also refused a Qatari request to increase the number of flights between the two states, according to Egyptian airport sources, in a further sign of rising tension between the two Arab states. 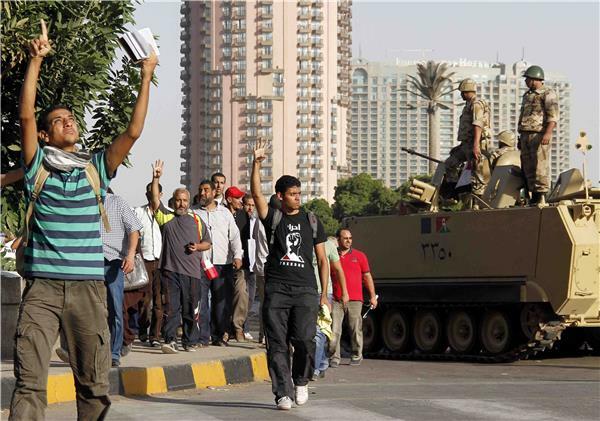 Cairo's relations with Qatar deteriorated after the Egyptian army deposed President Mohamed Morsi on July 3. Qatar had been a firm backer of Morsi's Muslim Brotherhood and lent Egypt $7.5bn during the year he was in power. Al Jazeera's latest piece on Egypt is now the lead story on the website. 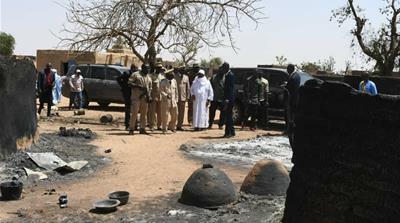 officials said, triggering clashes with armed groups based in the area. Vehicles carrying armed personnel were sent into the village on Thursday while army helicopters hovered above. 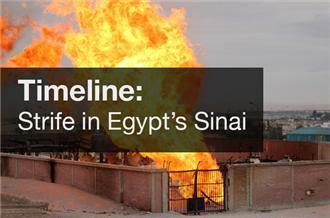 Our interactive team has been working to keep track of the ever-changing situation in Egypt. Below is a slideshow of some of the timelines and infographics they have created. Click the caption to be taken to the full-page interactive. The situation in Egypt's arid peninsula is becoming increasingly difficult. 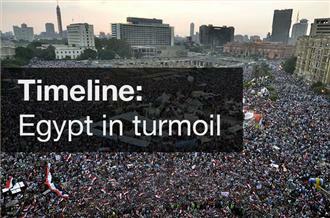 Follow the ongoing political and social upheaval in Egypt. 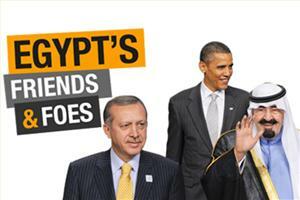 Take an interactive look at the changing international responses to the tumultuous events in Egypt.